I have been interested in building ships in bottles for a while. I even tried it once, when I was in school, with a complete construction set ("Bottle included!") A little plastic boat, blue clay, and it worked! But still, it didn't feel like the real thing. I wanted to do something a bit more serious than that. So, over the years, I kept some suitable looking bottles on the top of our cupboard, and I bought a book about constructing ships in bottles. But still, I didn't get started with it because I thought I needed to understand more about ships in general. Things about sails and rigging and stuff, which might also be useful in building a tiny boat. 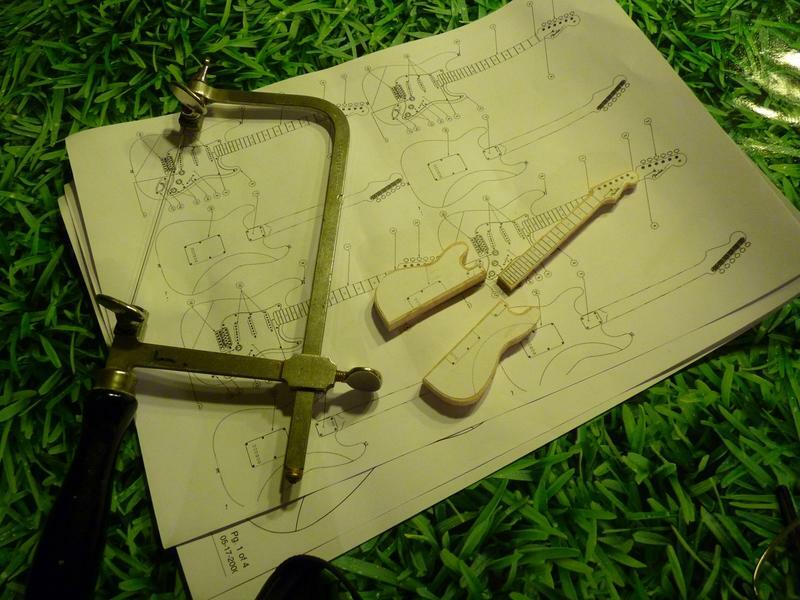 In the mean time, I had developed another hobby: building guitars. 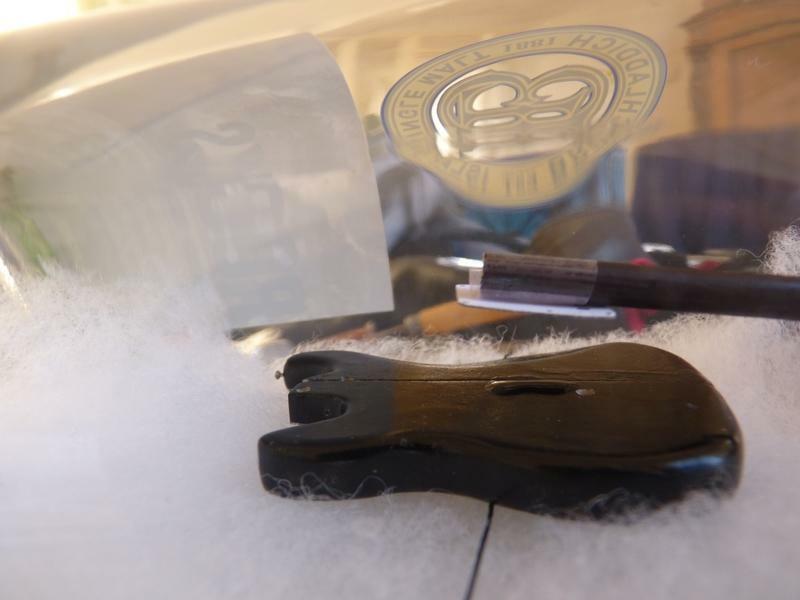 I had even mused about a combination of the two, but rejected the idea because I didn't think I would be able to make a collapsible body to fit through the neck of a bottle. Also, it would be completely ridiculous to try something like that if I hadn't even built a run-of-the-mill ship in a bottle yet. But then I was hit by a wave of inspiration (or maybe a fit of insanity) when I looked at one of my bottles. 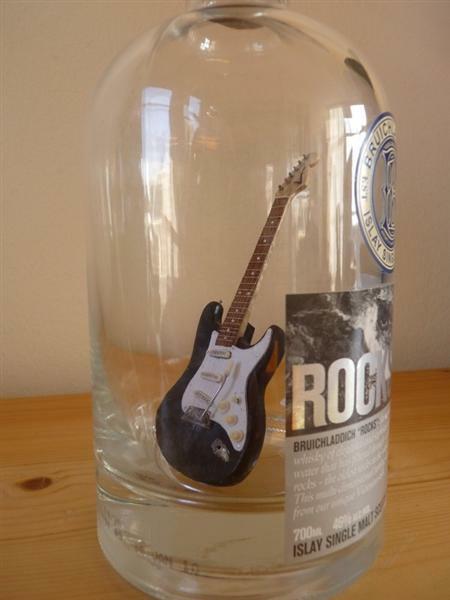 The label said: Bruichladdich "Rocks"... And then the penny dropped: I should forget my fixation on acoustic guitars, and make an electric one! 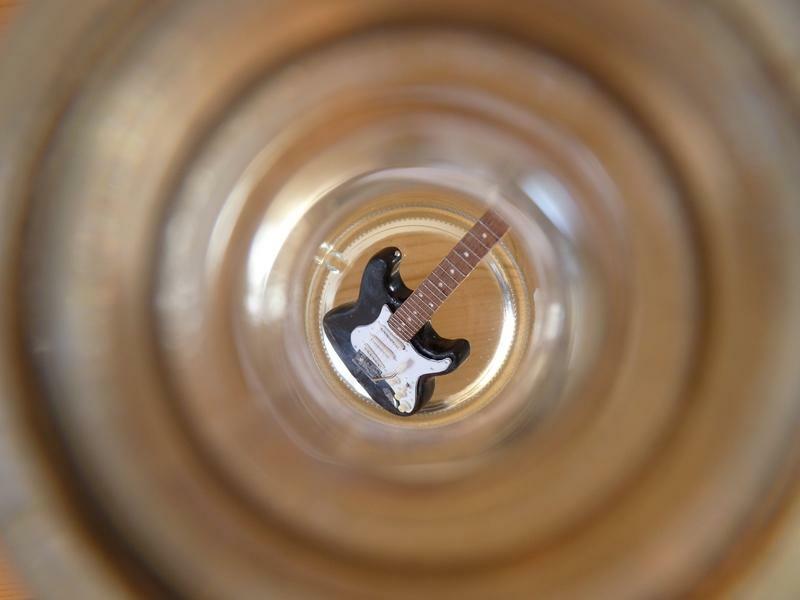 A standard, recognizable model of course, so a Fender or a Gibson maybe. After some consideration, I decided on an iconic Fender Stratocaster. That was really the first association that came to mind when I read the label, and I have one of those at home, so I could take accurate measurements. The whole process has taken a few weeks (not full-time of course!) and yesterday the build was completed. Actually, I had not dared to post anything about this building process, because I had a dark suspicion that the project was doomed to fail. 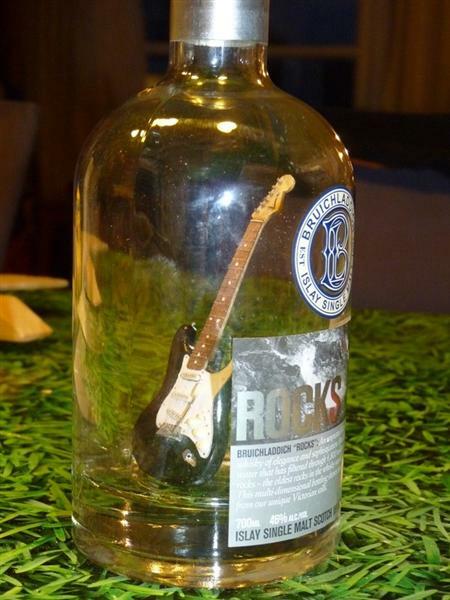 The assembly must be done in the bottle, unlike what you would normally do with a ship. A ship is usually made outside the bottle. You build it so you can fold down the masts to fit through the bottleneck. Once inside, you then pull up the masts with string. 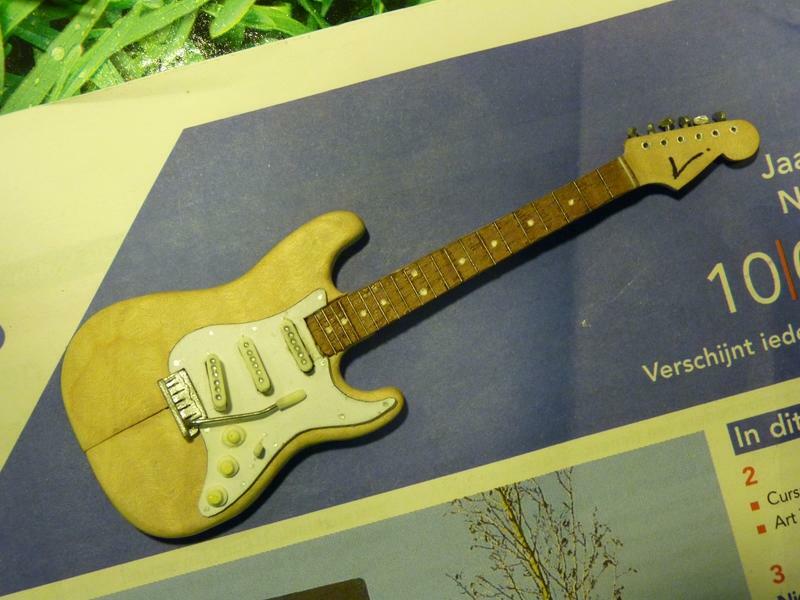 The first concrete steps: I have calculated that I can build the guitar in 1:8 scale. I will build the body in two separate halves and will make it opaque black. 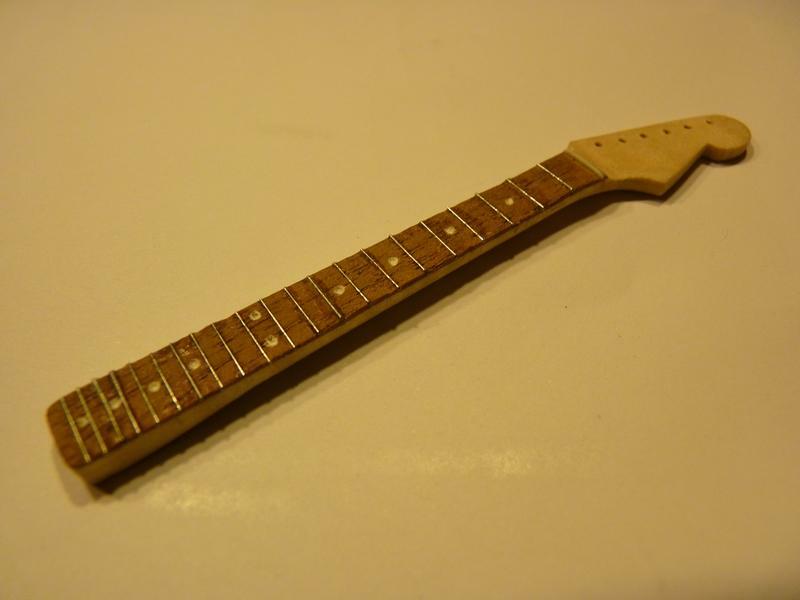 A maple neck, and rosewood fingerboard I think. There will be no skunk stripe on the back. 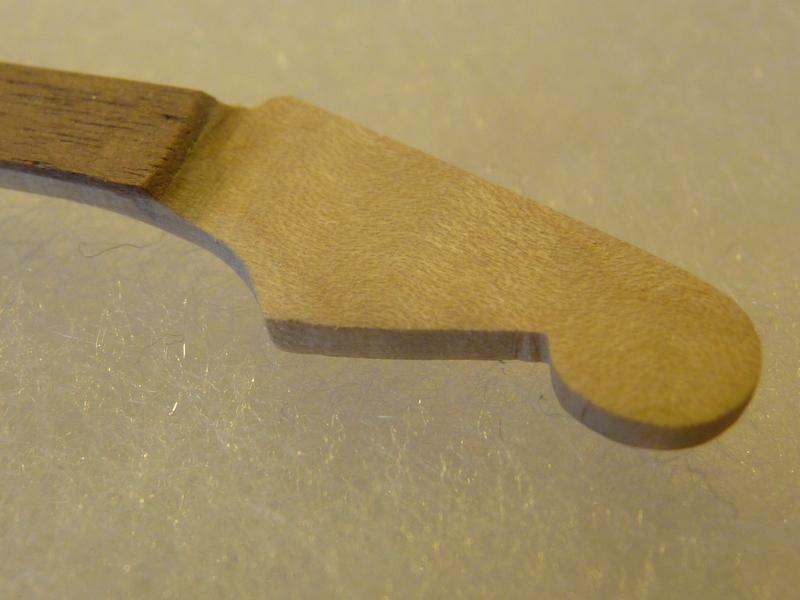 I have a pack of various kinds of veneer, which probably contains something that looks like rosewood. 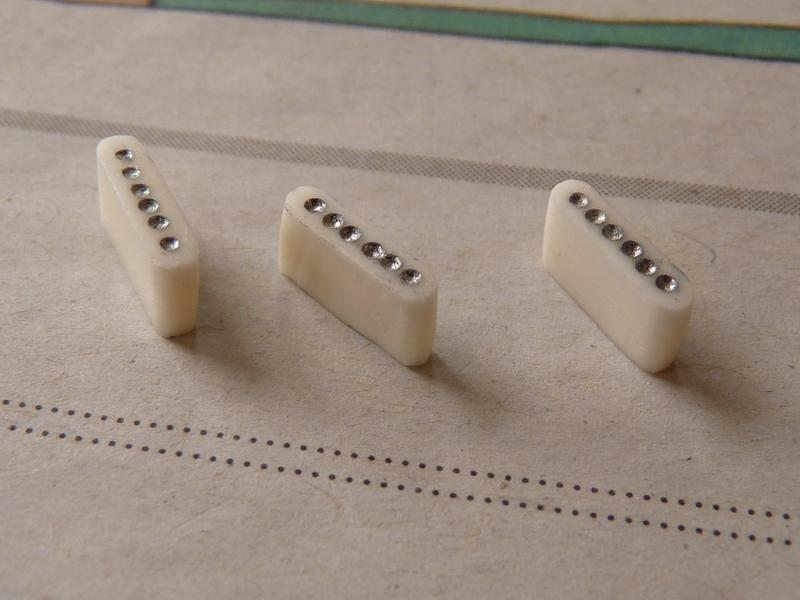 A white pick guard, SSS configuration, tremolo, and the standard stuff. 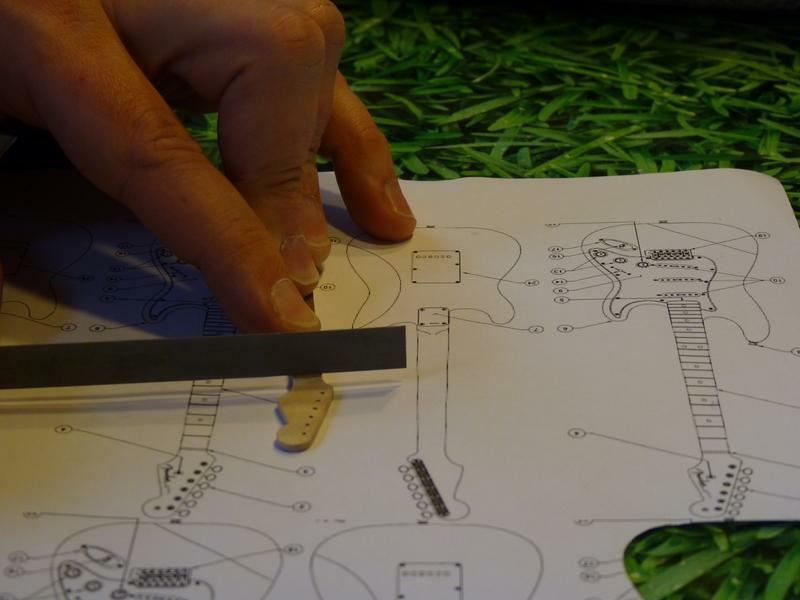 Hmmm ... the pick guard measures 2o cm at its widest point. A scale of 1:8 seems to be a nice size. Falls nicely in the bottle, standing up against the side. 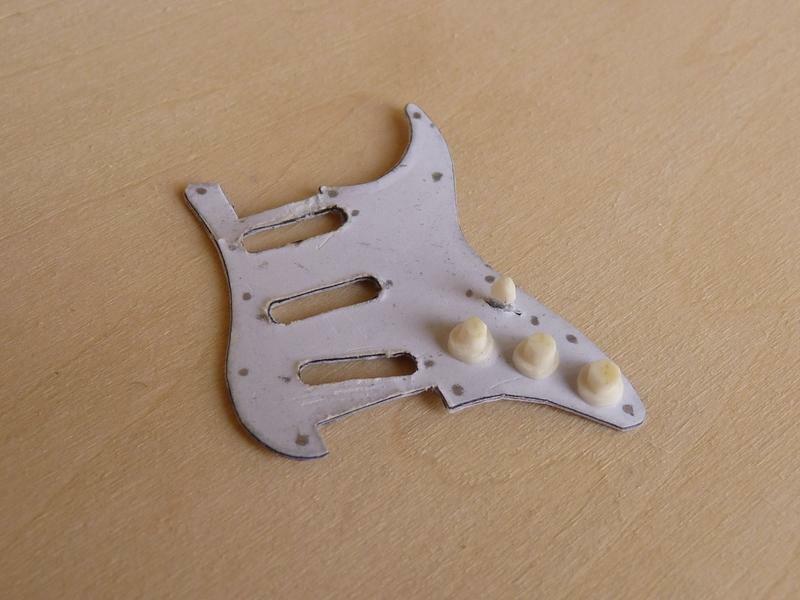 But then, the pickguard would be 25 mm at its widest. So it will need to be flexible to fit through the bottle neck. Meanwhile, I have an official drawing of a vintage '62 Fender Stratocaster. 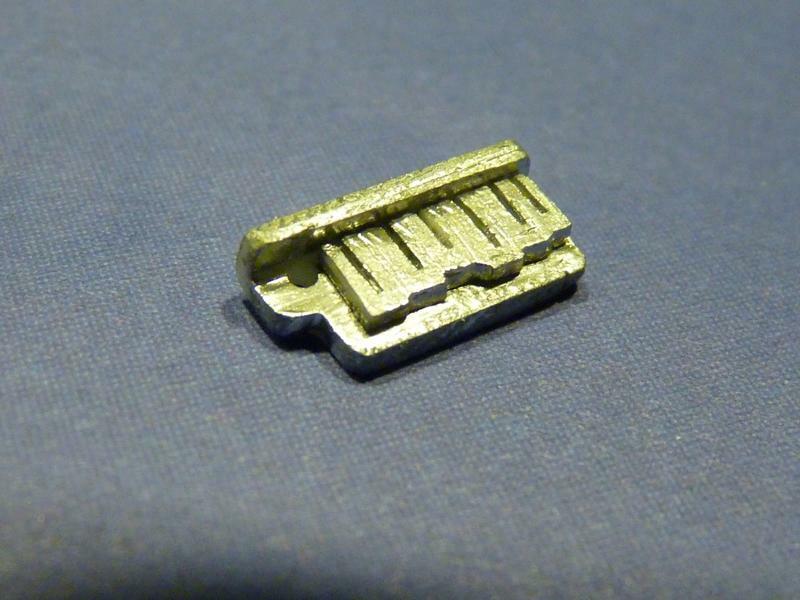 I scaled it to a length of 12.5 cm. and printed it a few times to cut and paste. First, the two halves of the body and the neck are cut out. It is not yet the right thickness or the exact shape, but it appears to be good to use. 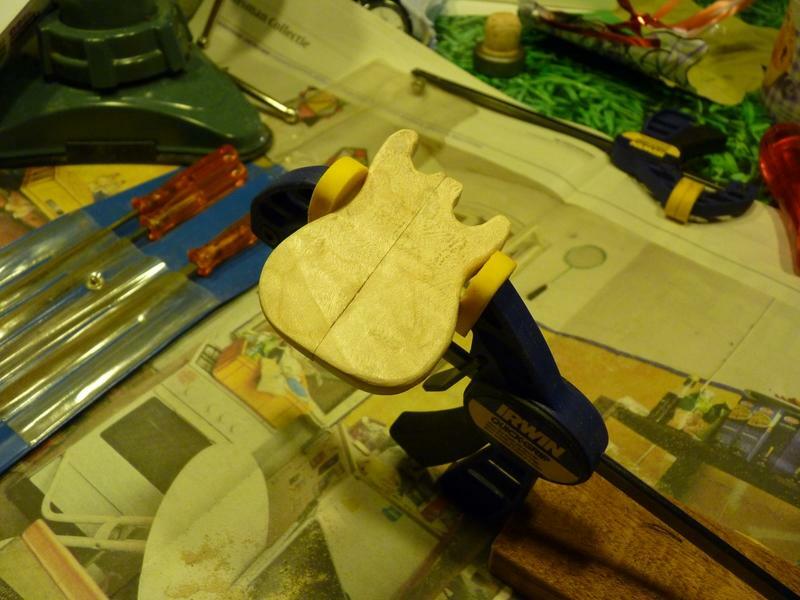 After some filing and sanding, the two halves of the body are the right shape. The seam is not quite in the middle, so one half fits easier through the neck than the other. Actually, the biggest half doesn't fit, period Yet, Hopefully, it will when I have finished the whole thing. achieved a great deal in recent days. The two halves of the body are completely smooth so that there is only one small seam showing when the halves are pushed together. Also, the largest half would still not fit through the neck of the bottle, so I had to shape the lower bout slightly narrower. The model is not quite true but it is not noticeable. 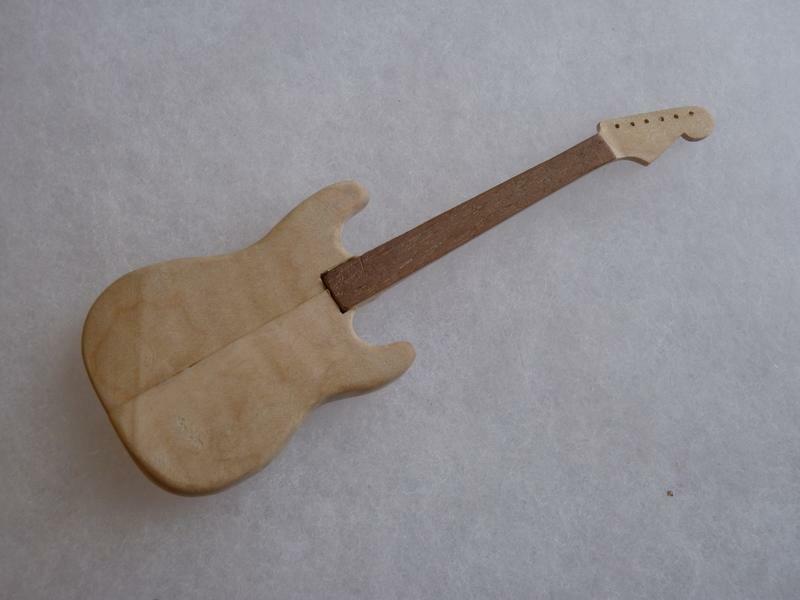 I glued a fretboard onto the neck but I am not sure what the wood is. It could be rosewood, but maybe something else. 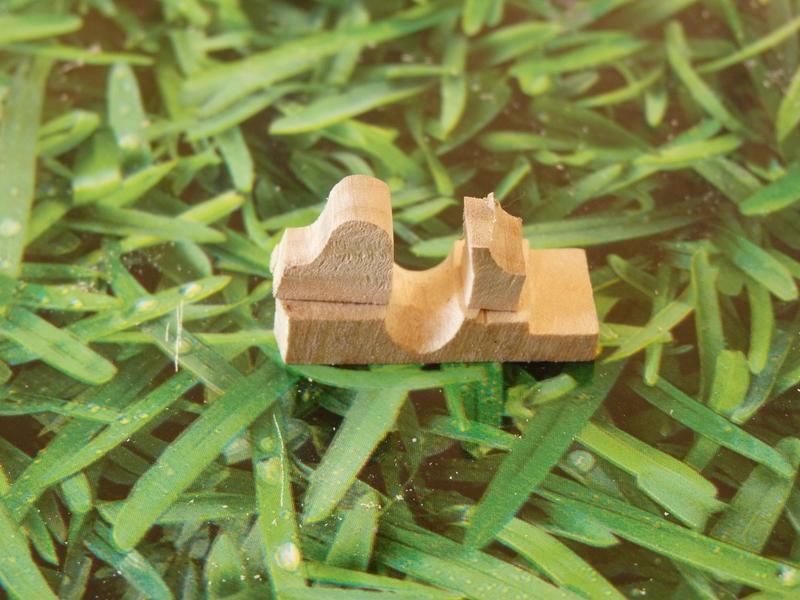 It comes from a set "a bit of everything" veneers, so you do not know. 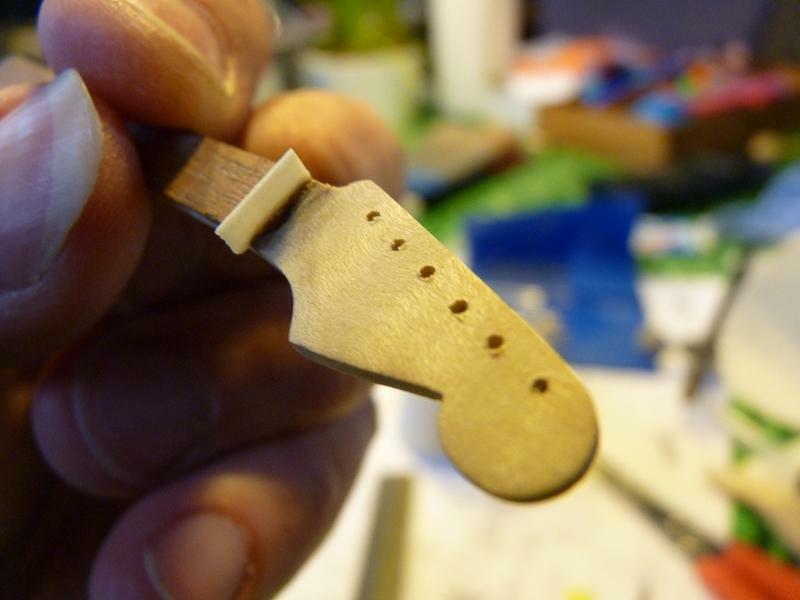 And the tuner holes were drilled with a small hand drill size 0.8 mm. Works well! Neck pocket excavated, but maybe it is a bit too deep now. 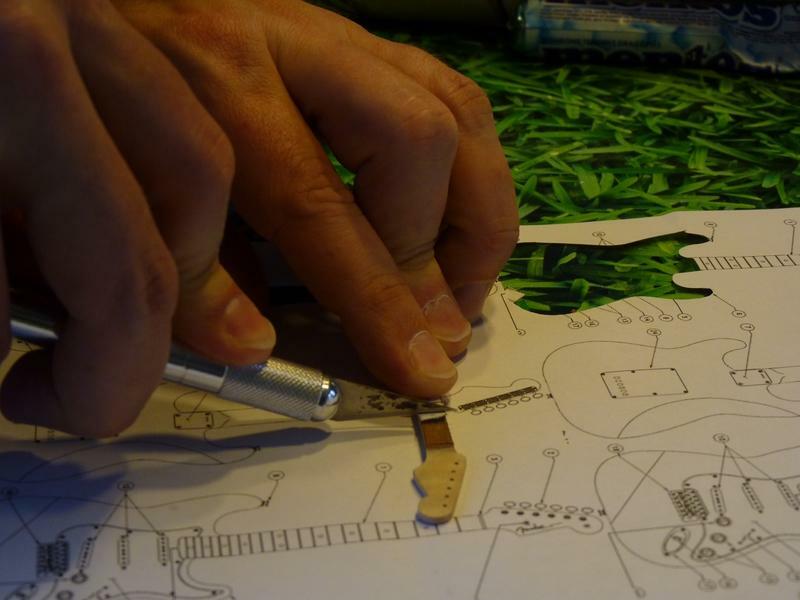 More work on the fretboard. A slot for the nut is filed. And a very thin piece of bone to put in. Dots positioned with a drill, and painted with white marker. 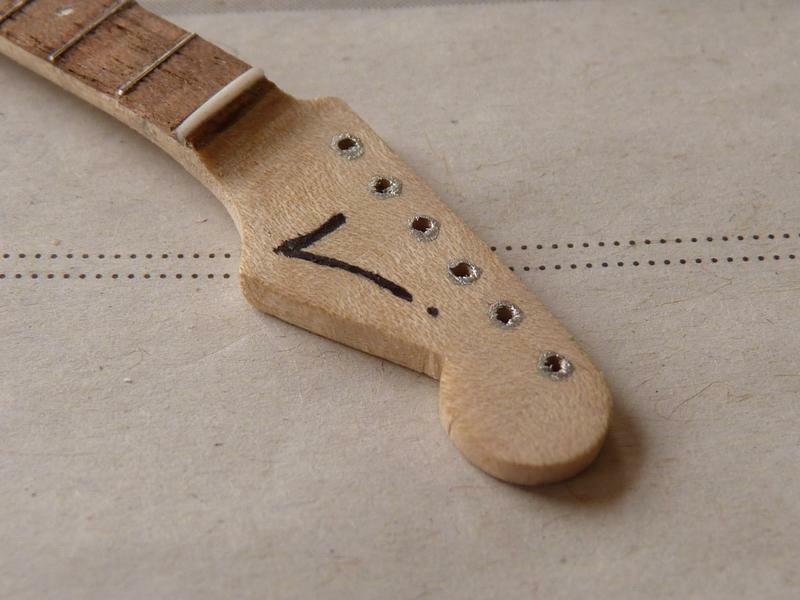 The fret slots are made, first with a knife. A little deeper with my sharpest small file, and then the frets are glued on. And of course the sides are neatly trimmed! 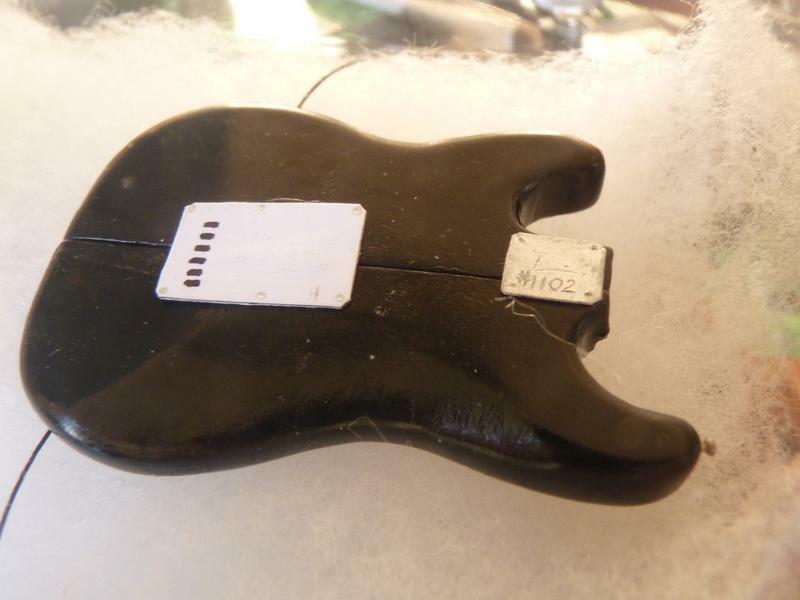 The pickups are made from bone. Yet another unorthodox material, but it looks good. I still need to figure out how I am going to do the pole pieces. Silver gel pen doesn't look quite right, but I also didn't like the idea of drilling 18 holes and putting real metal rods in them. Eventually, I drilled very shallow holes and a small silver mark is put inside the holes. I tried to file the top of one pickup in a shape that the pole pieces would stick out a bit, as they do in real life, but that looked even less convincing. 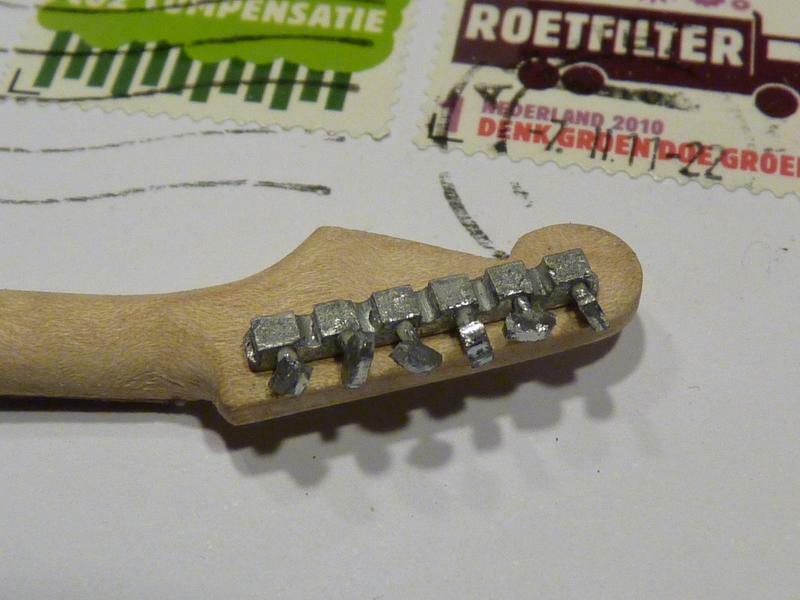 Next, some cosmetics to the headstock. Of course, it is not a genuine Fender, so I put on my own logo. 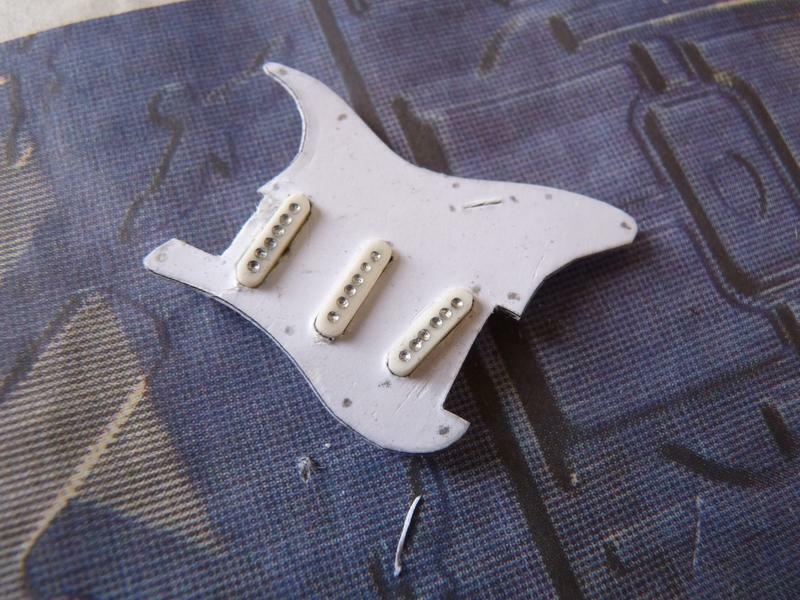 The pickguard (after a few unsuccessful attempts) was made using three layers of paper (white/black/white) glued together. Three layers of cardboard are too thick because it still needs to bend to fit through the neck. 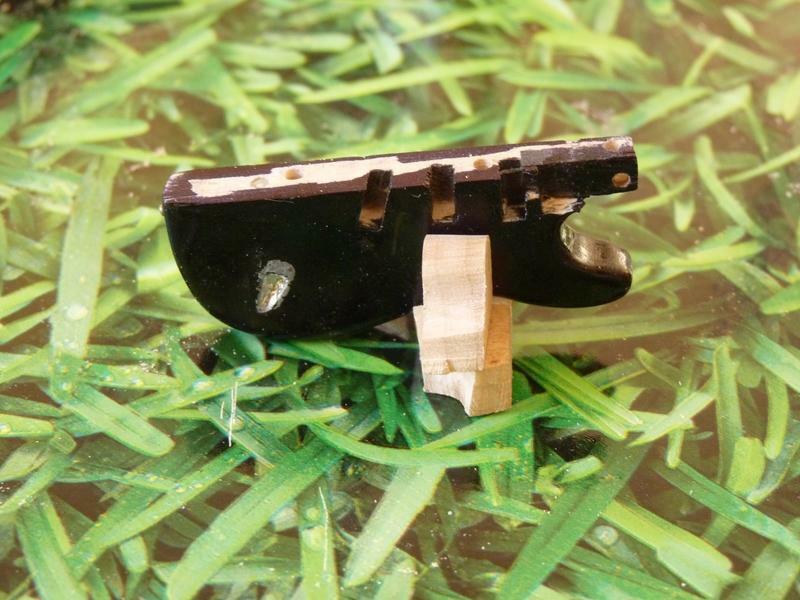 The screws are marked and slots cut out for the elements. It suffered a few scratches during the process, but I think it is good enough. 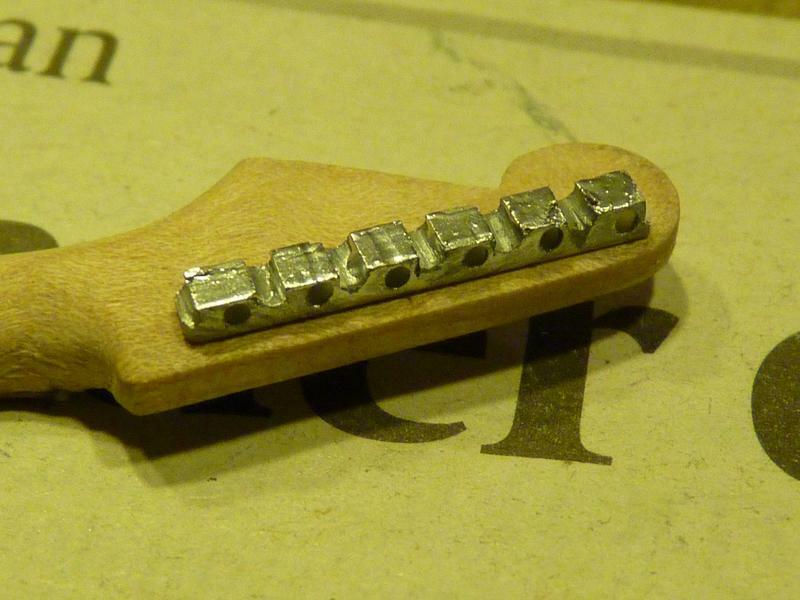 The tuners are made from a long piece of bone, so that six blocks are created with holes drilled in the sides. With thick silver marker, it looks a lot better right away. 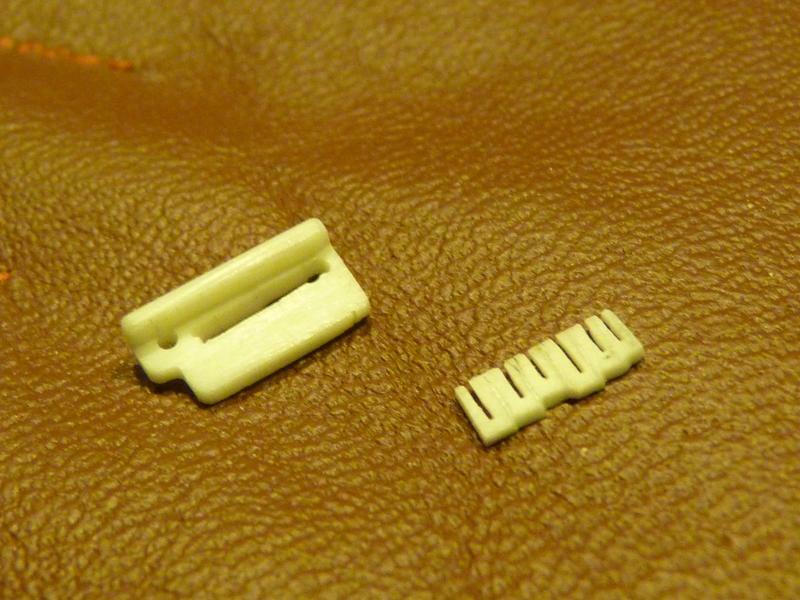 After a few experiments, the pin buttons are cut from a thin slice of bone and are filed so that they fit in the hole. 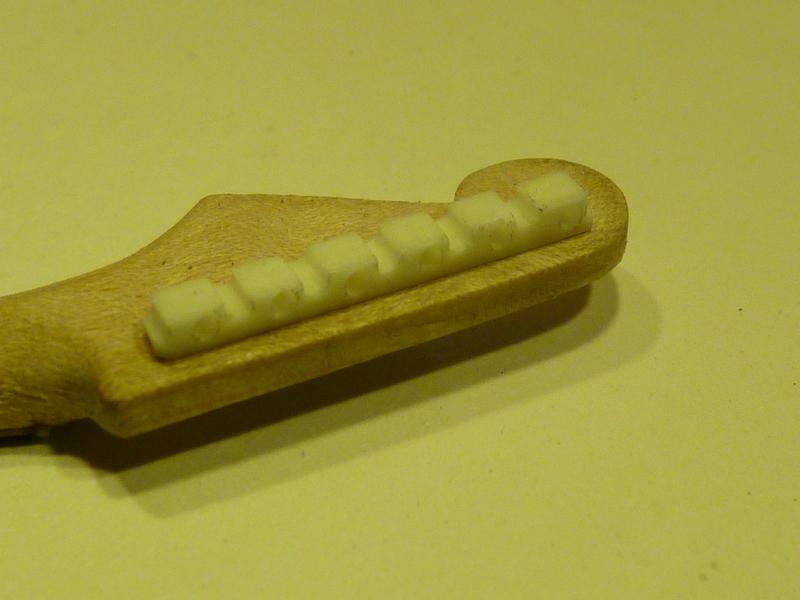 Bone buttons look quite nice; you only need to shape them, and they already have the right color. I scratched the top, painted some gold marker over it, polished most of it off again, so it looks like the buttons have have letters on them. They are too small to read, but you should know that they read "VOLUME" and "TONE" even without looking. The switch is also made from bone. 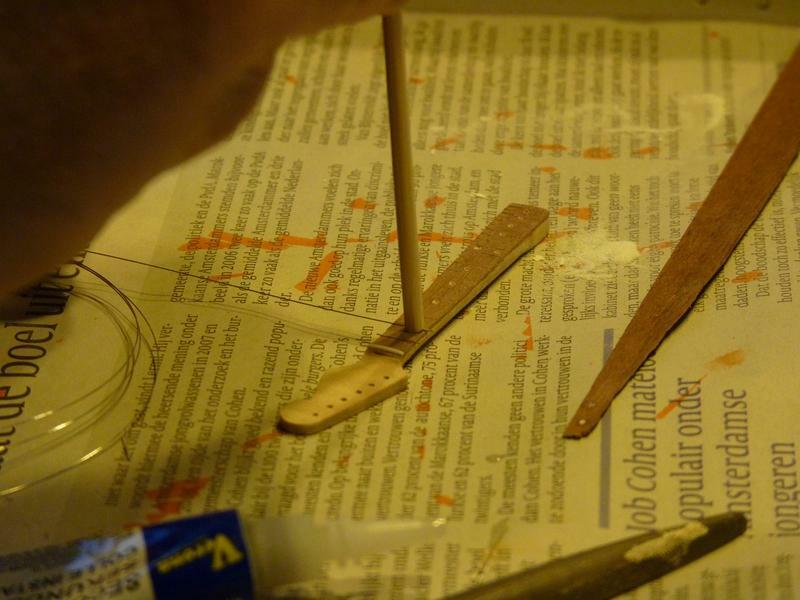 Bone works very well; in addition to being very sturdy, it is easy to shape and you can get pretty detailed work. 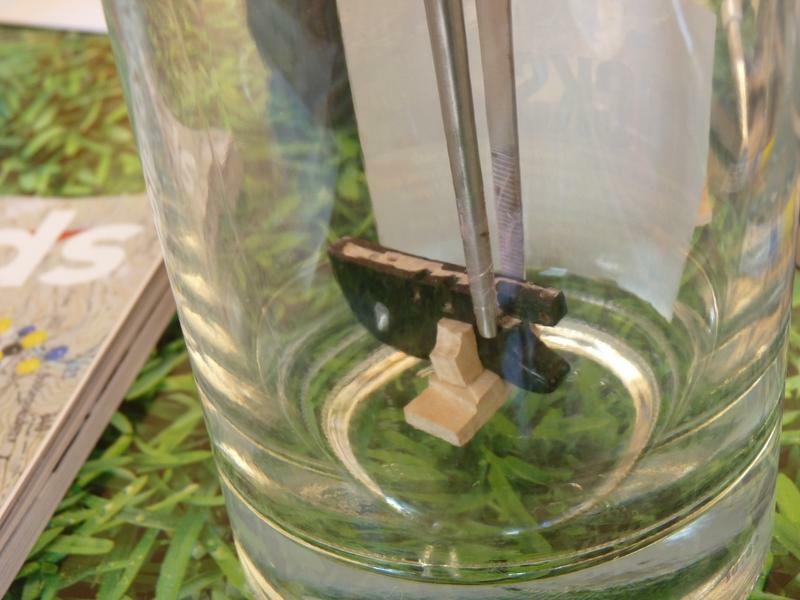 Wood splinters easily and on this scale is can be quite disastrous. Making the bridge is the next challenge. It is simply made, but it still looks convincing. 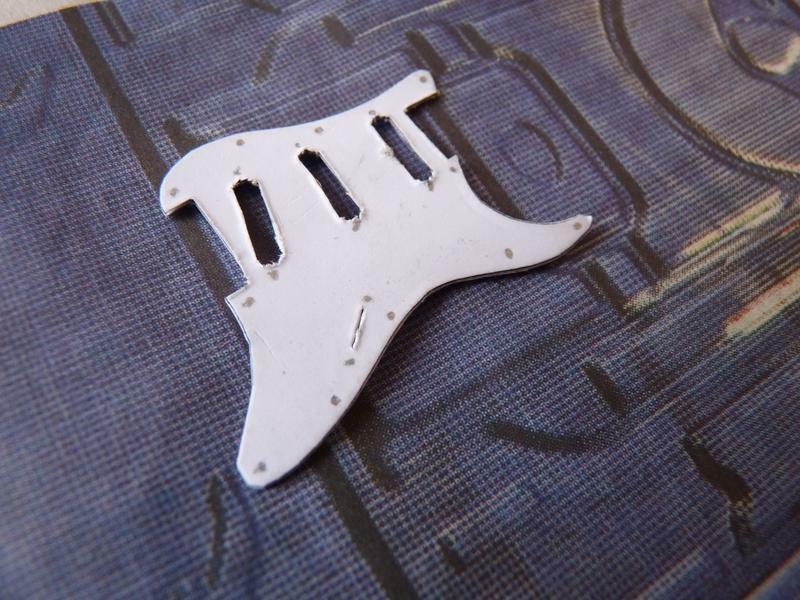 The plate is made with a raised edge, and (more or less by accident, but very convenient) it has a slightly slanted bottom making it seem like the string and tremolo tension lift the bridge a little. 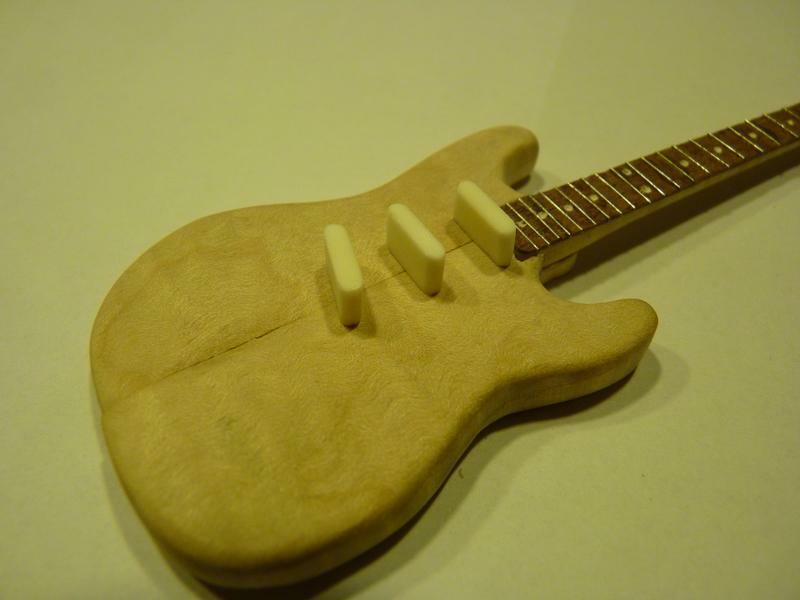 A hole for the tremolo arm, and a slot to make some room for the strings. Then I made a thin plate on top because I wanted to mimic the saddles. 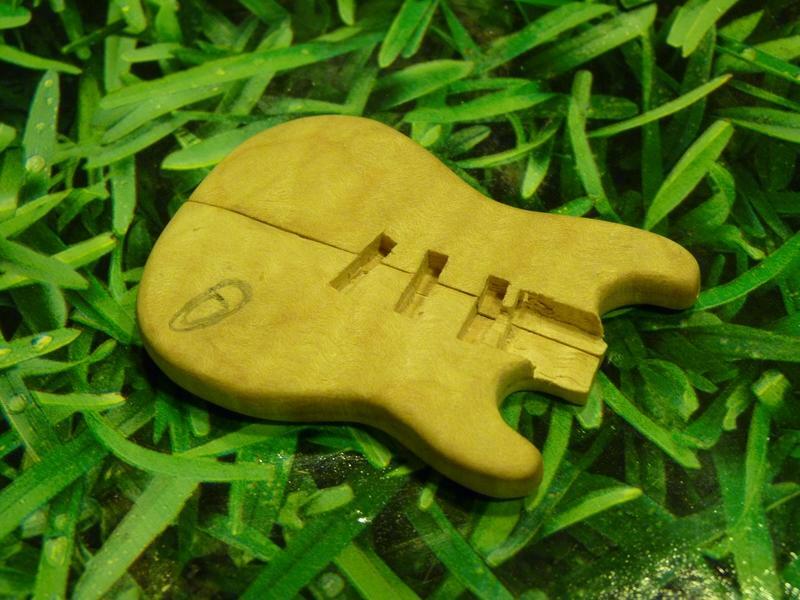 They are, like the tuning pegs, not made from six separate blocks, but in one single piece. However, two sets of three steps are filed so that it appears to be six individual saddles. 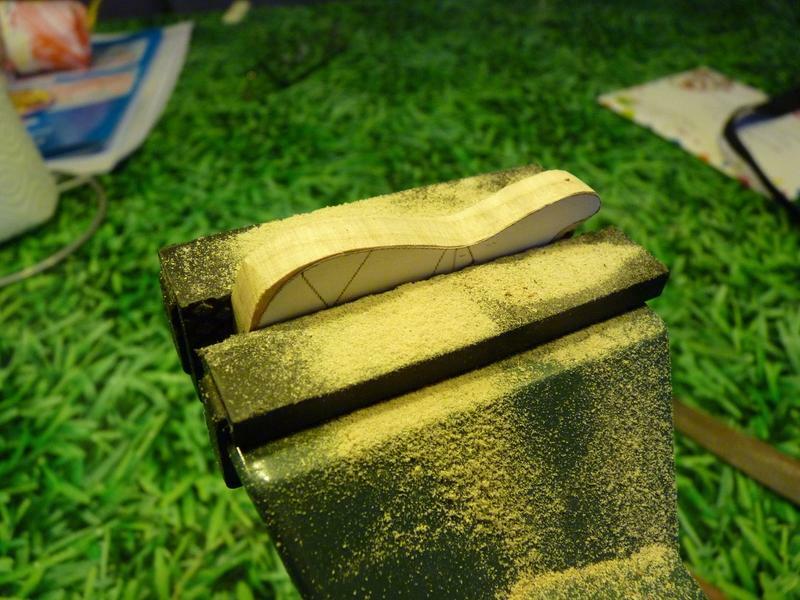 Six grooves are sawed in the back so that the strings can pass through, then underneath, through the slot in the bridge plate next to the next saddle and back up. Glued together and painted silver. 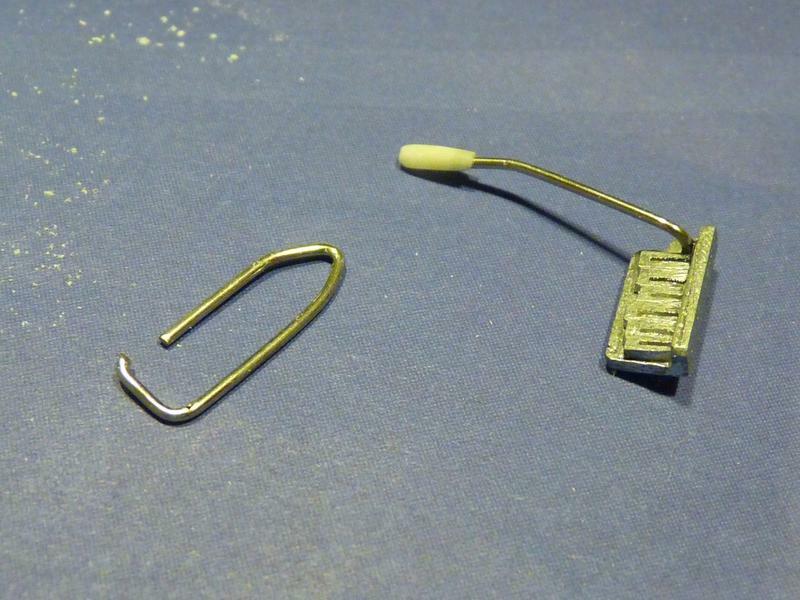 The tremolo arm was easy to cut out from a paper clip with a button (bone, of course!) placed on the end. Already the full mockup looks pretty convincing I must say. I did not expect it to go so well! Only in the detailed pictures you can see the imperfections very well. But hopefully, it will look better in real life. Screwing Pins are tough! They are hard to cut even with a jeweller's saw. Cutting with a nipper works, but I also messed up the nippers a bit. Putting the body together is still quite difficult. My plan to join the sides together with pins is not very reliable. There is still a lot of play and you still get the two halves not fitting together properly. I did a test run to see how they can be maneuvered in the bottle. Well, hardly. My big tweezers can only be used at a small angle and skewers aren't working either. 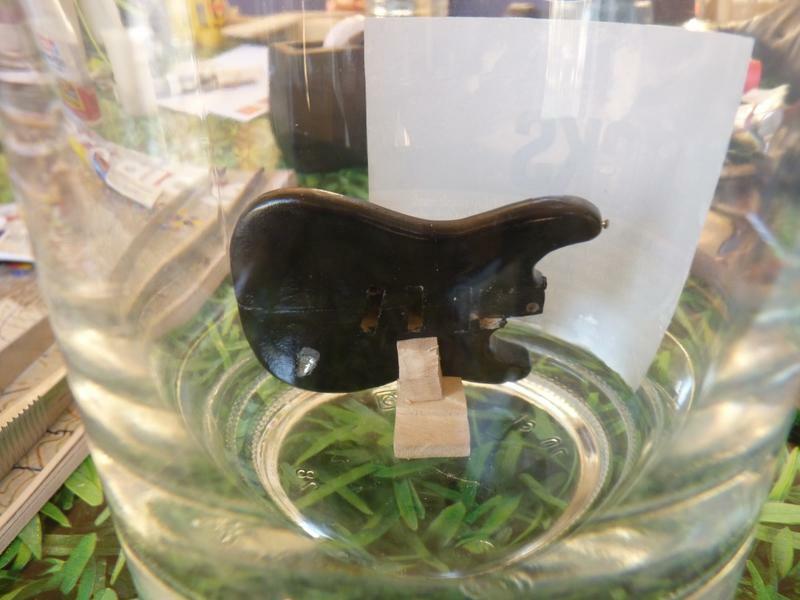 The new plan now is to connect the two halves with a connecting strip of plastic or something, so a hinge is created. Maybe, I can invent a structure with a rope on the neck side, so I can pull together the two halves so that they snap shut. Wait ... With a little luck a hinge is not necessary. I must give this more thought. Behind the back plates, you can conceal quite a few loose ends! The cavities of the elements are there now and everything still seems to fit neatly together. 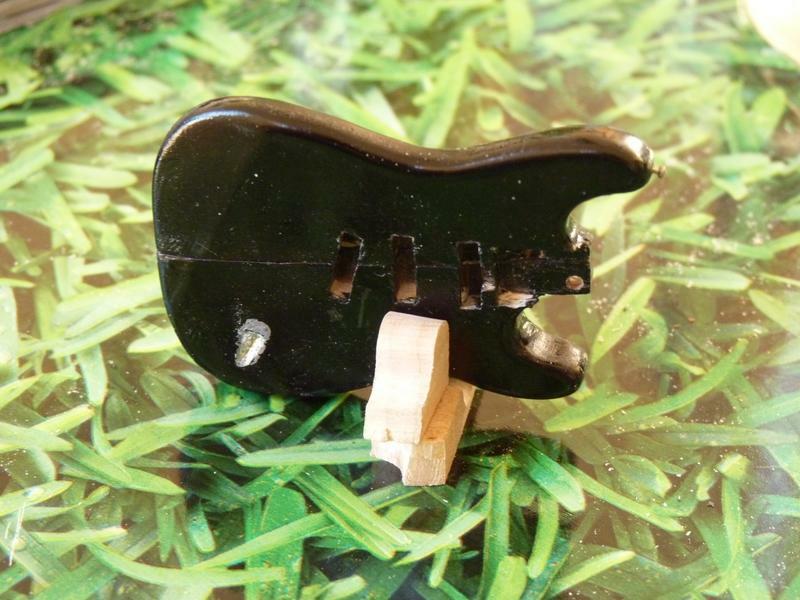 Only the hole for the jack plug left to do and then it can be painted. 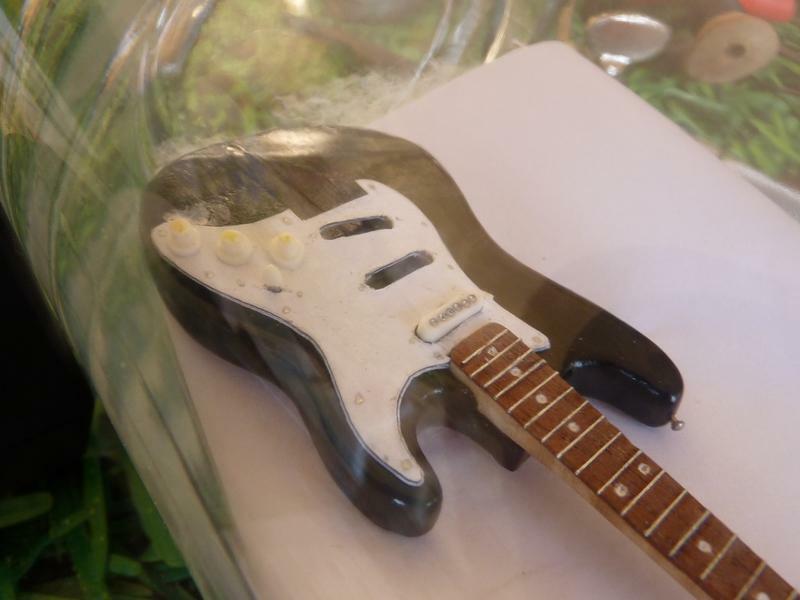 Painting such a small guitar is a tedious job, especially because the scale is only 1/8th of the original size. Colossal drips, bubbles, bumps, wrinkles would show if this was full-sized. I have painted with minimal resources; two layers of black and two white coats over it. 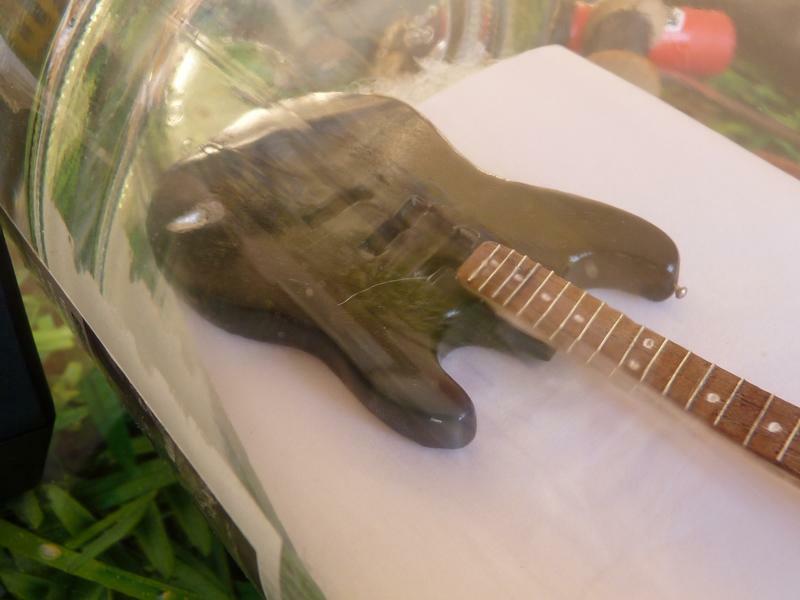 The neck has only two layers of clear coat because it is only only cosmetic and the lacquer does not actually have to protect the neck. Here and there are still some ugly spots, but if I do any more lacquer spraying, I am afraid it will not go through the neck of the bottle. It is already a very tight fit. Next time I need to be a little more careful. 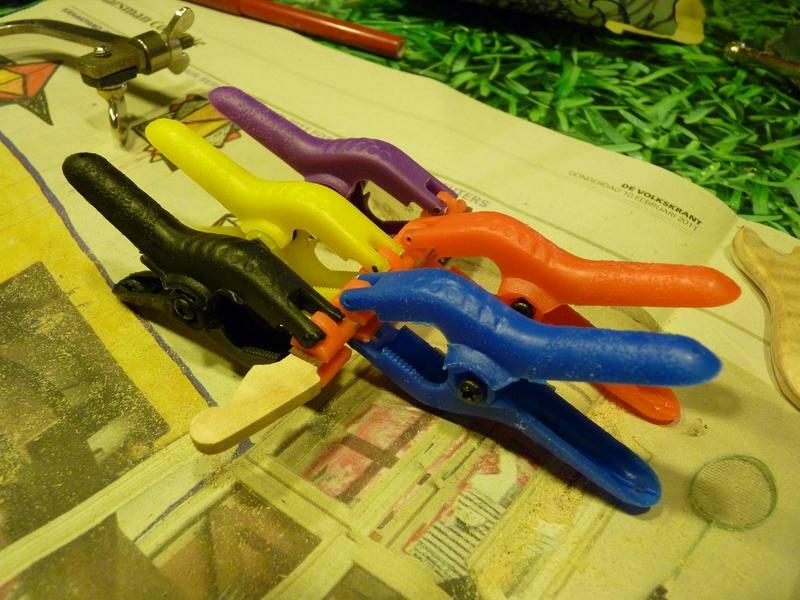 The things I painted on the headstock have run out in the lacquer, so I should have done that the other way around. The neck is neat, a beautiful flame! I put some oil onto the fretboard and immediately it looks a lot fresher. There were some ugly scratches and things on the fretboard, but they are very hard to see now. 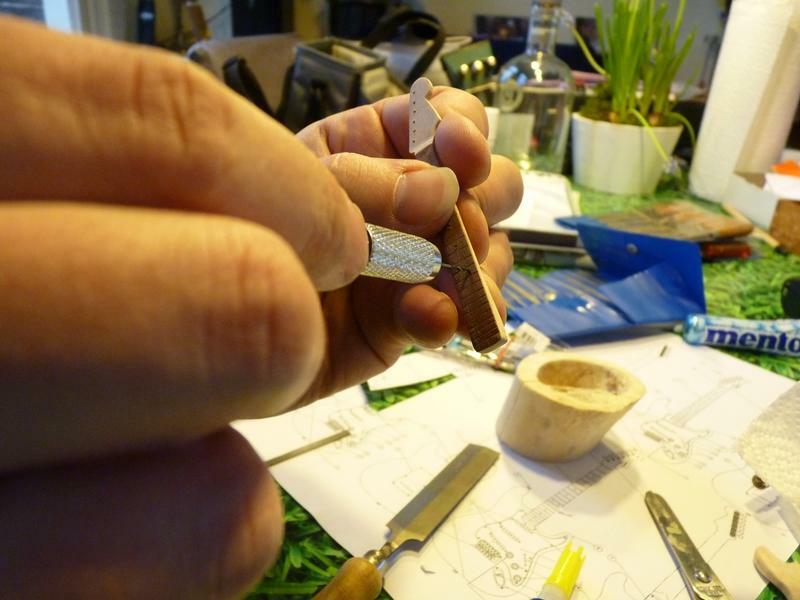 And finally the nut is finished with a sharp small file. You have to look very closely to see it so you might wonder what good it is, but I think it is important for the construction. 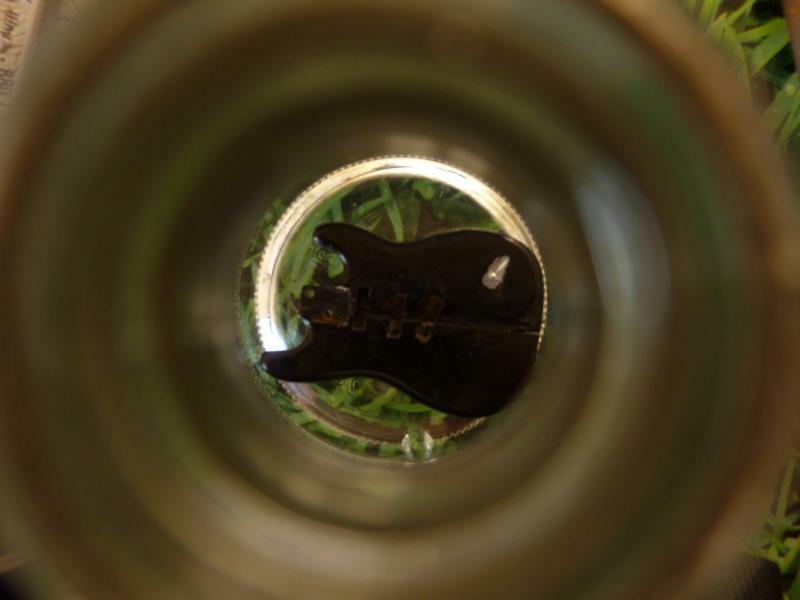 The nut now has six tiny slots for the strings. without those, the strings would slip off the sides easier. The Day of Truth ... The experiments with using the strings are not very promising. It was too wobbly and unreliable so I decided to go with the original method of using pins. I made a little stand to put the two halves together. After a few dry runs, I eventually plucked up the courage to place the whole thing in the bottle. The first half went well. Apply a drop of glue and then place the second half. Actually, it went remarkably well! And so the body is assembled in the bottle, and the point of no return is reached. Next, I placed a pad inside the bottle. That way, the pieces are a little higher in the bottle and you don't need to work around corners. The next step was attaching the plates on the back. These are nice and simple, and allow you get a little feel for the sticks and the large tweezers. For the plates, I used chopsticks with a piece of tape on the end. Once the glue has dried, you can pull the tape off. 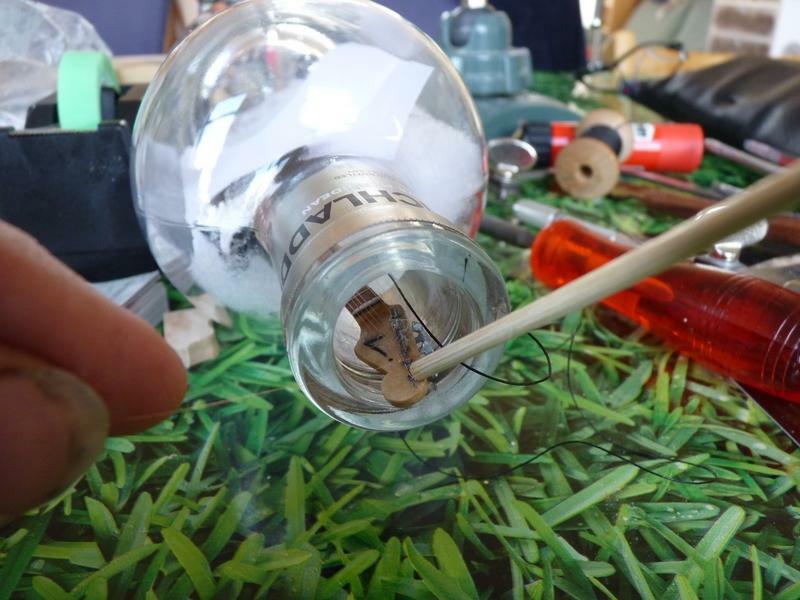 Place the neck in the bottle and position it with tweezers. The pick guard was another puzzle. It needed to ben a little to fit through the neck. 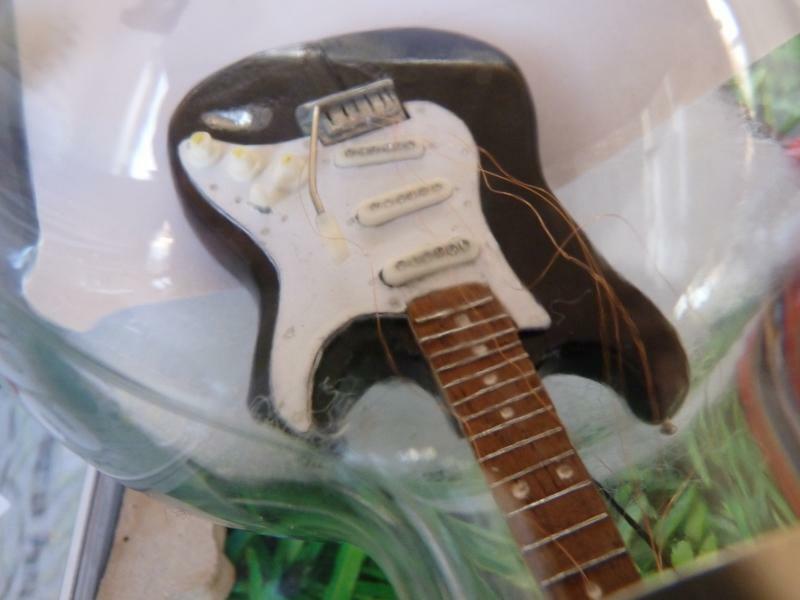 Then, I pushed it flat again, and tried to push in the pickups. Without glue so the pickguard wouldn't get stuck in an impossible position. 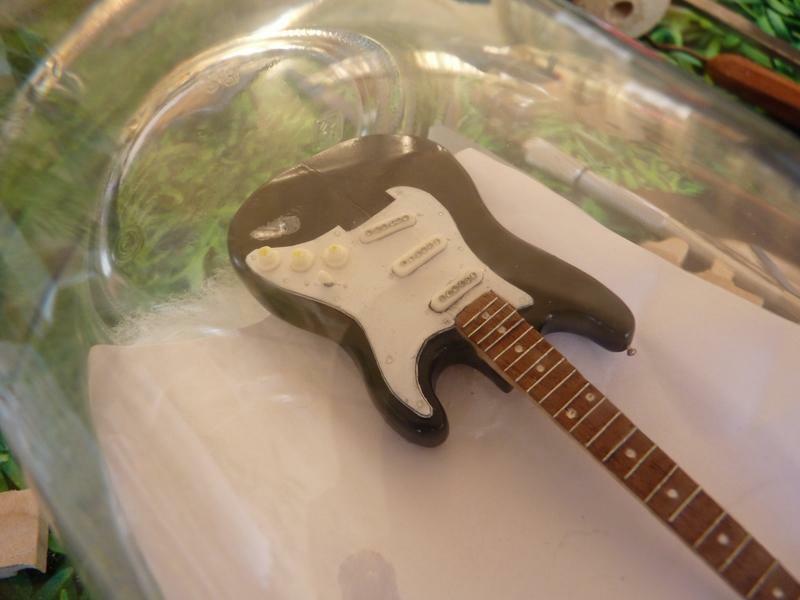 The final pickup did get a drop of glue, and finally, I put some glue underneath the pickguard too. The final pieces are also in place, with a drop of glue. You are almost there! On the bridge, I have attached three pieces of wire laced two strings side by side, marked with a flag on each end of the string. 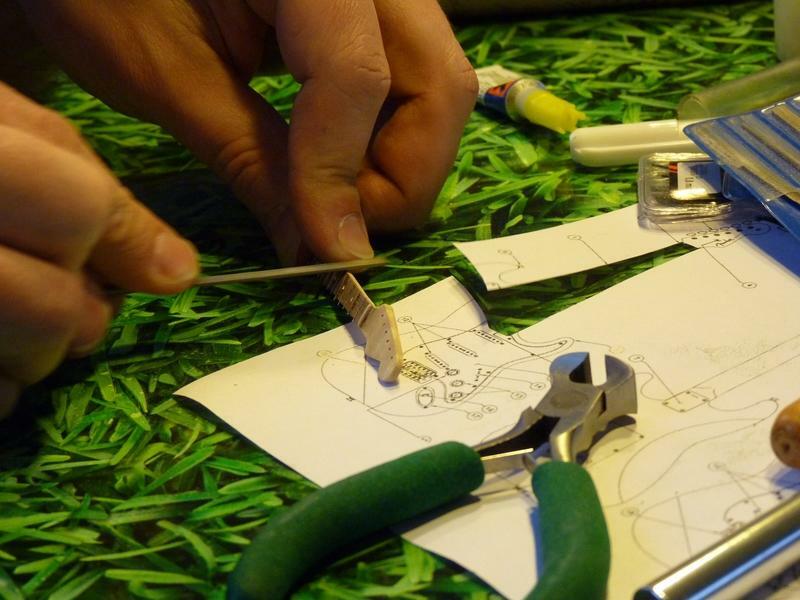 The bridge is very careful put in its place, and it is only a matter of attaching the strings. Sadly, I mixed up the low E and A strings somehow. So I ended up with a broken A string. 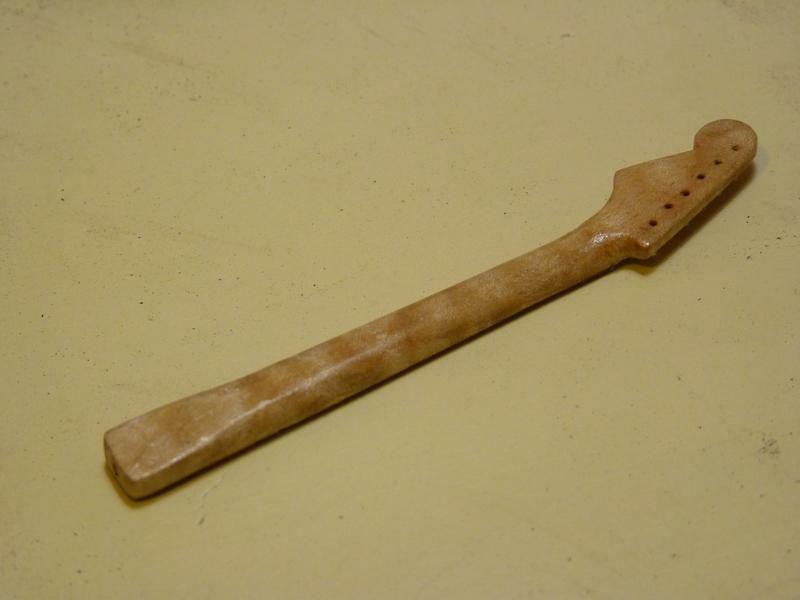 The final four went really well through, with half the headstock just outside the neck. I felt a bit like I was performing the surgeons' work that you see on the TV series. A final rescue attempt for the broken A string: a drip of glue on the bridge and gently drop in the end of the wire attached to a stick. Wait until the glue dries, and cross your fingers that the stick will come off the wire without pulling everything to pieces again. And yes! It works! 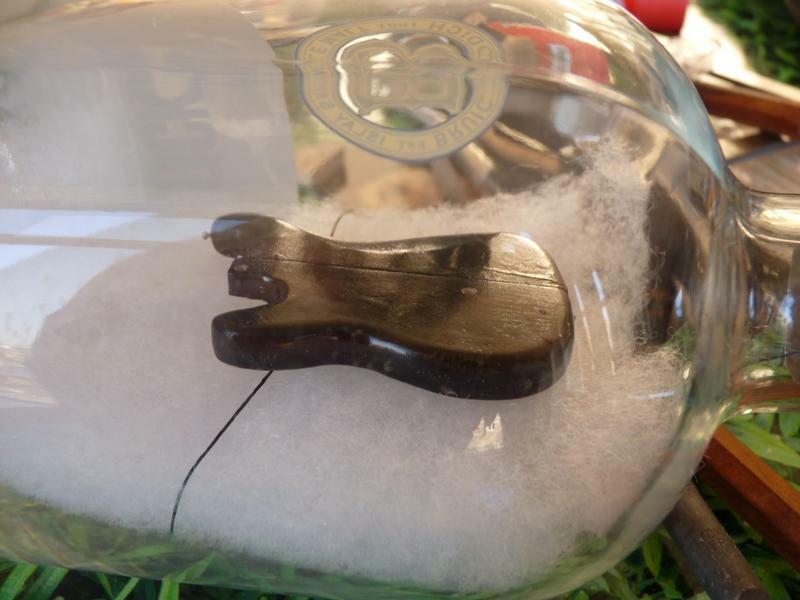 The last string is tied to the headstock, and with the pad pulled out of the bottle, it is ready!